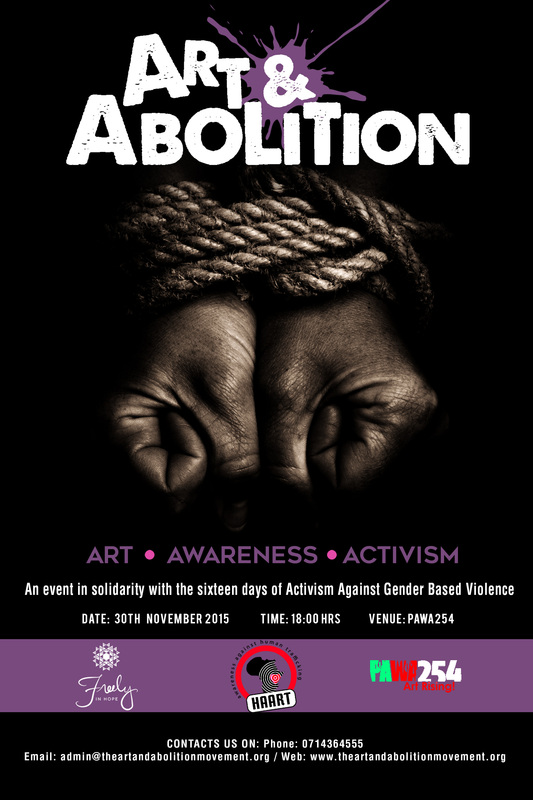 Art & Abolition discourse, November 30, end minors’ sexual slavery. Art and Abolition will hold an event on November 30th in solidarity with the UN Women’s Campaign: 16 Days of Activism against Gender-Based Violence. The Art and Abolition event will take place at the Mageuzi Theatre (PAWA254, Africa Alliance of YMCA Building, State House Crescent, Nairobi) at 6PM. Featured works from Arts to End Slavery will be exhibited, along with various artistic performances. Guest speakers from Freely in Hope and HAART Kenya will address the issue of sexual slavery in Kenya. Art and Abolition is rooted in the conviction that “until we are all free, none of us are free.” The event is not about charity but about solidarity. It is a movement of everyday people coming together and honoring their responsibility as global citizens, which is to promote awareness and galvanize action to end violence against women and girls. The organization Art & Abolition, strives to end sexual violence by rooting itself in the healing power of the arts. The organization specifically targets girls aged 15 and under who, because of poverty and/or pressure and threats of violence from their caregivers are being forced to sell their bodies for everyday needs like food, water, and school fees. The end goal is to liberate survivors of sexual slavery, change mentalities in communities concerning sexual abuse, and equip caregivers with tools for financial stability. Art & Abolition does this by offering healing arts programs, education, and economic empowerment. According to the US department of labor’s bureau of international labor affairs report 2014, In Kenya, children are only required to attend school until the age of 14. This standard makes children ages 14-15 particularly vulnerable to child labor as they are not required to be in school but are not legally permitted to work. Come join the discourse and stand in solidarity with this noble cause.